I can’t recall exactly what it was that made me pick up Gone, Gone, Gone. Perhaps it was its simplistic cover that seemed to speak volumes more than any of the fake covers being mass marketed these days. Or maybe it was the synopsis that alluded to a homosexual romance, death, sniper shootings, and coming to terms with life as we know it. Either way, I am so immensely glad that I decided to read this incredible novel. Gone, Gone, Gone is unlike anything I’ve ever read before – and not only because it’s my first LGBT romance. It’s also because it is heart-warming, poignant, and bittersweet in a way that no other book ever has been before. It is a true coming of age story and masterpiece of literature which I was incredibly fortunate to find in the back shelves of my library. All I can truly say is that it doesn’t deserve to be there – instead, it belongs in the very front for the entire world to see. Just months after the attacks during 9/11, Lio moves to Maryland with his father and two sisters, leaving behind the mother who abandoned him and carrying with him the painful memories of his twin brother who didn’t survive the cancer that plagued them both. Lio is shy, reserved, and quiet – the complete opposite of talkative and outgoing Craig – yet they are both drawn to one another. Craig is still dealing with the breakup of his lifelong best friend and ex-boyfriend Cody, who went crazy after his father perished in the Pentagon. Craig, filled with guilt at not being able to save Cody, attempts to save as many animals as he can and, of late, Lio. In the midst of this are deadly sniper shootings that plague the citizens of Maryland and threaten the lives of everyone dear to these two boys – including, most surprisingly, themselves. 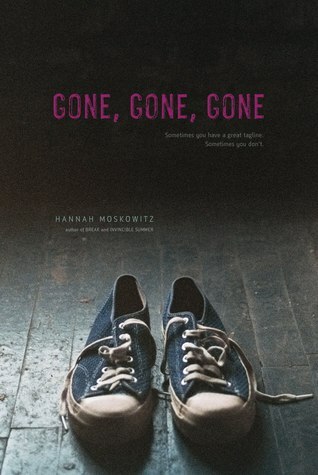 Gone, Gone, Gone is truly a character driven novel like no other. This story is told from the alternating POVs of Lio and Craig and through their perspectives, we are able to see what these two boys are dealing with. Yet, more than a contemporary romance dealing with family issues, this novel is achingly American. Moskowitz has managed to capture the true sentiments of being a teenager and the fear that plagued this nation simultaneously within Craig and Lio. Like all teens, they believe they are invincible – the statistics prove how unlikely it is for them to be shot, the statistics indicate that the tragedy that befell New York was far greater than that in Maryland, the statistics show that they will be safe. However, as Moskowitz explores, tragedy cannot be measured by numbers, safety cannot be measured by percentages, and lives cannot be measured at all. Furthermore, I loved that this novel did not feel like a LGBT romance. Perhaps I have phrased that incorrectly, but the love story in this book did not feel different or hard to connect to at all in comparison to the usual romance that fills the pages of contemporary novels. Thus, Moskowitz was able to show her readers that a LGBT romance was really no different from any other love story and I admired the subtle manner in which she accomplished this. In addition, the romance in this story by no means took away from the plot itself. The story arc of this novel revolved completely around these two characters – Lio and Craig – who feel more real than characters probably should. Gone, Gone, Gone is their story – the story of their romance, their growing up, their struggles, and their acceptance to live the life they have been given and live it to their best abilities. In all honesty, I don’t think I will ever read a novel like Gone, Gone, Gone again, simply because nothing quite like it has ever been written. It is beautiful in its subtlety, brilliant in its writing, and unique in its subject matter. Although there have been dozens of short stories, poems, and novels written about 9/11, none of them have focused so much on its aftermath, let alone its affect on teens. Young adults growing up during this time had to not only deal with the trauma of this event, but also the other issues that went on in their worlds as well the difficulty of growing up into the person they want to be. Thus, I feel as if Moskowitz has truly managed to capture all of that with a grace that I believe is unrivaled. Gone, Gone, Gone is the type of story that many will be recommending, even in years to come, and I am proud to be one of them. So, what are you waiting for? Go, pick up a copy of this book, and immerse yourself into the heart-breaking, yet hopeful, world that Moskowitz has brought to life. What are you still doing reading this? Go, go, go. Oh nice, I really want to pick this up now. (: Seems very different from the books out nowadays. Thank you for the review! This book has received a tremendous amount of positive reviews that I feel almost obligated to read it! Marvelous review Keertana, and I agree, the cover has a simple, subtle beauty that I find really appealing. Wonderful review, hun! I am so glad you enjoyed this too! You're so right about the love/romance, it was just like any other teens in love and that was brilliant! Really good review! This book does sound different then anything I've read and your right about not many books being about Young Adults and the after math. I'll definitely check this book out!